The late Peter Algar, pictured in a garden in York, on June 21, 2010. Pic by MH. 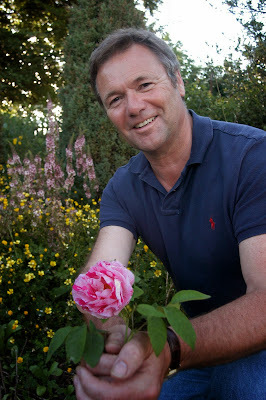 Peter at the time was in search of the 'lost' Towton Rose of medieval legend. (See this link). SUGGEST to the average Yorkshire man or woman that he or she owes a significant part of their proud heritage to the Lancastrians, and it would probably be enough to cause a riot. While the story of the White Rose (and that of the Red) and the loggerhead rivalry between Lancashire and Yorkshire throughout the centuries is infamous in the north, historians have long known of a different story behind that of the popular saga. Most know of the bloody Wars of the Roses, and the clash between Lancashire and Yorkshire. But historians who have researched the period are swift to point out that the actual clash – and ensuing rivalry – should more correctly be viewed as a north/south divide, rather than a geographical clash between neighbouring counties. More surprisingly perhaps, it is being claimed that the so-called ‘Yorkists’ were actually largely Southerners, while it was the Lancastrians who held sway in the north – including the geographical county of Yorkshire. The late historian and author, and Yorkshireman, Peter Algar, researched the period of the Wars of the Roses extensively. “It’s a popular misconception among many in Yorkshire that the Wars of the Roses were fought on purely geographical grounds – i.e. Lancashire in the west fighting Yorkshire in the east across the county borders. In fact nothing could be further from the truth. “In reality, the conflict, at the time, was known as the ‘war of the cousins’ - not the Wars of the Roses - and it was between the HOUSE of York and the HOUSE of Lancaster which was more aligned on the north /south divide at the time of the bloodiest period of the wars, at Towton. “The House of York at the time was largely southerners to a man; while it was the House of Lancaster which would have held sway across the North – and that includes using Yorkshire as a recruiting ground. “It might be an unpalatable truth to some many die hard Yorkshiremen but our geographic county would most likely have been a recruiting ground for soldiery to serve the Lancastrian (ie. The HOUSE of Lancaster’s) cause. Large parts of it were under the sway of the Duchy of Lancaster and the Lancastrian families of Percy and Clifford. Any “Yorkist” held land in Yorkshire at that time was extensively looted. “The House of York members were the Duke of York (killed at Wakefield) and his sons Edmund of Rutland (killed at Wakefield), Edward IV, Clarence and Richard III (killed at Bosworth). “The other leading Yorkists were the Nevilles of Westmorland and Warwick but they were prone to change sides. “But the Yorkists i.e the House of Yorks’s main recruiting ground for the common soldiery was the South (not Yorkshire) and parts of Wales and Ireland. “It was only when Richard III restored favour in the north when he was governor here for quite a while during his brother’s reign, and doled out wealth to his Northern supporters that the House of York had greater influence in the county. This all dissipated when Henry VII came to the throne. “In my general experience as an occasional lecturer on the subject, the public – especially die hard Yorkshiremen - do not like being appraised of this. They have long held views of a geographic Yorks vs Lancs conflict. Look at the cricket and Leeds Utd v Manchester Utd or Leeds Rhinos v Wigan Warriors today. “In reality, this was more of a North South divide and as uncomfortable as it may seem, we should celebrate our ‘Northern-ness’ with Lancashire. “We held firm together during William I's harrying of the North, the WoTR, the Pigrimage of Grace and the later Civil War (as Royalists). As northerners, we don't like change, especially if it is imposed upon us from Southerners. But at the time of the Wars of the Roses, it was the ‘Yorkists’ who were the ‘southerners’. “As a possible modern parallel for today, we have a Duke of York - but he doesn’t live in York and only occasionally visits there. “Even more confusingly to some perhaps, the two houses didn’t use the symbols of the white and red rose during the Wars of the Roses. “During the battles, the Yorkist symbol was the ‘sunne in splendour’ - a triple sun or parhelion (which is a well-known astronomical effect sometimes called a sun-dog) reportedly witnessed by Edward IV, the Yorkist leader, before the battle of Mortimer’s Cross. “The Lancastrian symbol was a double S collar or a Swan – this is the imagery they would have used at the time – not a white and red rose. “When Henry VII (Henry Tudor) ascended the throne at the end of the War of the Roses, his claim was tenuous at best. His link to the House of Lancaster, was through the Beauforts, an illegitimate relationship, that was later legalised to make the family respectable. “He needed to secure his position beyond doubt, so he set his sight on Edward IV's daughter, Elizabeth of York to unite the two houses, bolster his claim to the throne and prevent further civil war. He needed a medieval marketing campaign to do this and his advisors came up with the idea of using the two roses as emblems, and then uniting them. This was how the red and white Tudor rose came to be. “The symbols were given to counties during the Victorian period when they wanted to organise counties, boroughs and municipalities. In typical Victorian style, everything had to be grand. Sir Walter Scott was very popular at the time, and some say he is responsible for coining the phrase, the Wars of the Roses. “The first record of a White Rose for the House of York (Roas Alba) was for the emblem used by Edmund of Langley, the first duke of York in the fourteenth century. The red rose emblem was used by Edmund Crouchback,the first Earl of Lancaster. This was the damask, Rose of Provins or Rosa Gallica as it was variably known, but as Edmund was born in 1245, this is way out of our period. · Shakespeare has a key part to play in the use of Roses as symbols. In his history plays from the period, especially Henry VI Pt I, Act 2 Sc 4, the warring rivals pluck white and red roses in the Temple Garden scene. · Some editions of Shakespeare’s canon list references ‘The First Part of the Contention Betwixt the Two Famous Houses of York and Lancaster’ rather than as Henry VI Pt I, II and III. · The late Peter Algar authored the popular Yorkshire novels The Shepherd Lord and Dead Man’s Hill novels. He was an associate member of the Towton Battlefield Society and lectured and wrote widely on the subject of the Wars of the Roses. He sadly died in June 2012 and is missed by many.